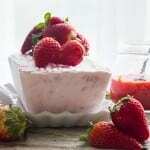 Strawberry Tiramisu, a fast and easy no bake Dessert. 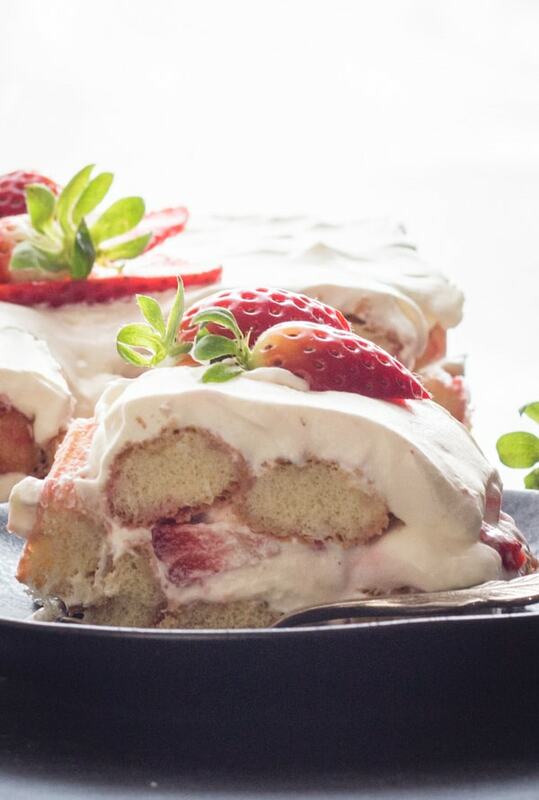 Made with fresh strawberries, cream and mascarpone. An Italian Classic. 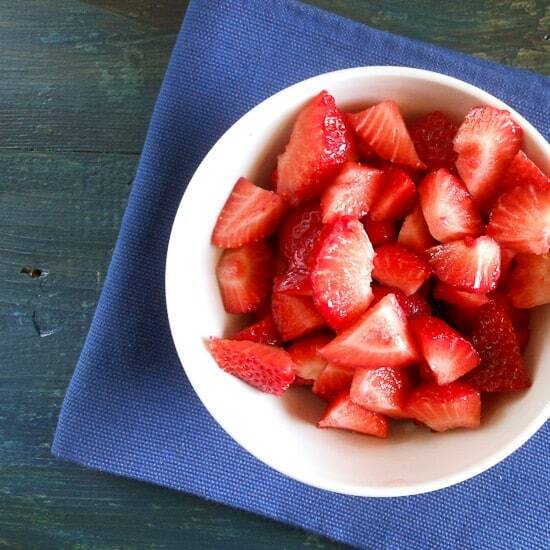 Nothing screams summer like spending a nice weekend at a cottage or eating berries, especially strawberries in my case . Luckily for me this year I was able to have two strawberry seasons. In Italy strawberries arrive in early May and in Canada early July. 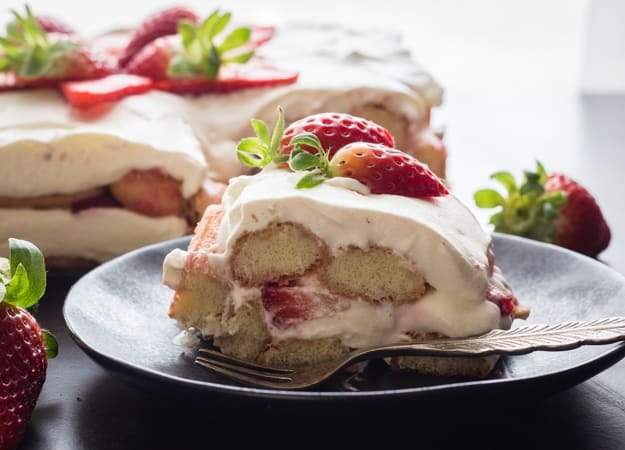 My daughter enjoyed her stay and swim at a family cottage this past weekend and we all enjoyed a refreshing and delicious dessert made with strawberries purchased at the local farmers market. And nothing like some yummy Easy Tiramisu Recipes. 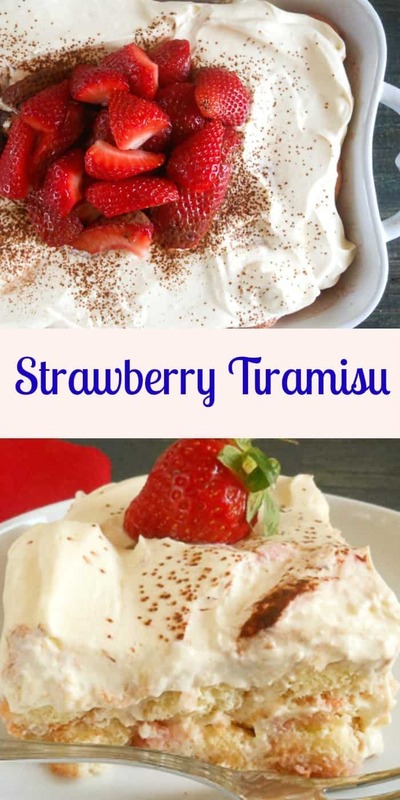 Some people like to add strawberries to their chicken salad, but I have to be honest with you, I don’t like mixing fruit with vegetables or meat so I will keep my strawberries for dessert and there is nothing like a Strawberry Tiramisu Recipe! 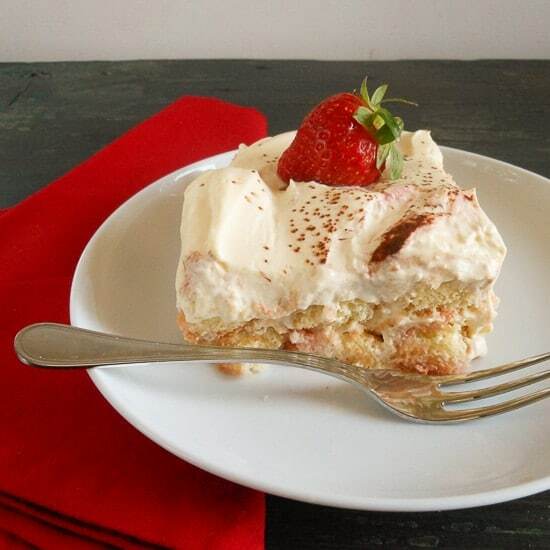 I think this strawberry tiramisu does justice to strawberries. 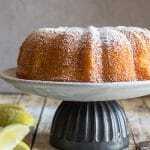 It is an Easy Summer Dessert Recipe. Not only does it call for whole strawberries, but also homemade strawberry juice. Any left over juice would be perfect over ice cream or just with ice, to be enjoyed as a delicious, cold drink. Enjoy! *For the replacement of raw eggs, you can try using a product called Egg Replacer or there are now pasteurized egg products and pasteurized eggs available. 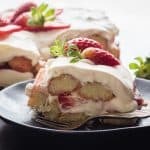 To make the cream mixture: In a medium bowl whisk together sugar and egg until combined (approximately 1 minute) then add mascarpone and cream, beat on medium until thickened. 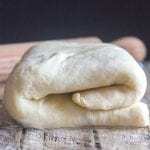 (approximately 5-10 minutes, you don't want it to be too thick or too thin, nice and creamy ). In a small bowl add half the strawberry juice to strart,(you may have left over strawberry juice, which is great over ice cream or even add a little more sugar and it makes a great drink) dip the lady finger cookies in the juice (turning to coat all the cookie with juice, but don't leave them submerged in the juice) then arrange cookies on bottom of baking dish and cover with half the cream mixture, sprinkle with 3/4 cup chopped strawberries, repeat cookies for another layer and cover with remaining cream mixture. 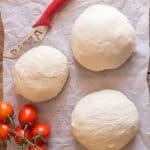 Refrigerate for at least 4-5 hours or even over night. Top with fresh strawberries before serving. Enjoy! 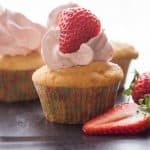 Other Delicious Strawberry Desserts you may enjoy! 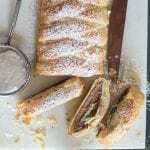 hi, I just made this recipe but realized I used Italian ladyfingers instead of regular ones. Is that okay? Hi Jamie, that should be fine, I think the Italian ladyfingers are the correct ones. Although I have never seen different types. So much variety. 🙂 Have a great Sunday. This looks so refreshing….Any chance to omit the egg altogether? No egg substitute where I am…. Hi Frida, sure you can just omit the egg, I do it sometimes and tastes just as good. Hope you enjoy it. OMG tiramisu is my favorite dessert ever. 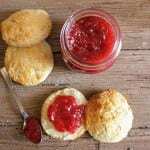 And with strawberry season is full effect right now, I am definitely going to be giving your variation a try – and probably eating the entire batch. 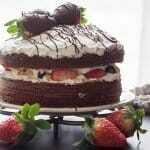 Hi Jennifer, thanks, the Strawberry version is a big hit in my family. Hi April, thanks, I know I am starting to see strawberries everywhere! I have never made any tiramisu but I love the stuff. 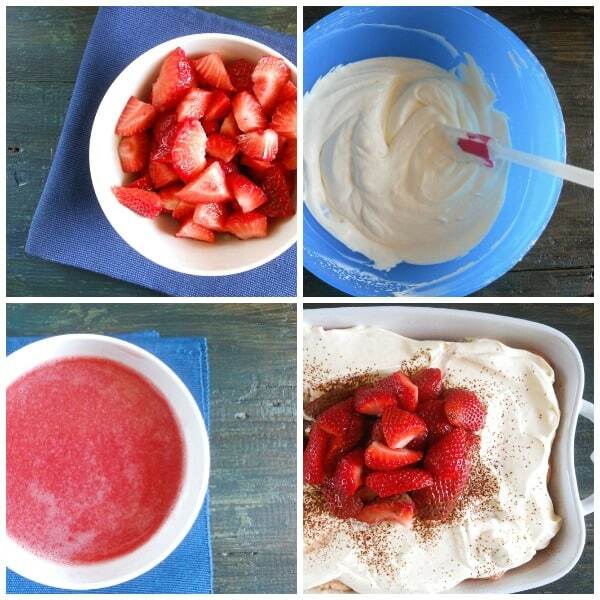 I also love strawberries, summer cottage days, and warm weather; I can’t wait to make this in just a few months! Thank you for the delicious inspiration. Hi Dan, thanks so much, Tiramisu is a must try. Hope you enjoy it. Hi Marie, If you are concerned about using raw eggs I advised using a product called egg replacer, there are now pasteurized eggs available on the market. I hope that helps. Thanks for linking up to Creative K Kid’s Tasty Tuesdays linky party a week ago! I’m finally pinning my few pins! I’ve pinned it to the Tasty Tuesdays board. Hello, thanks again for pinning and for hosting the link up. This looks awesome! Thanks for linking up last week to the Bloggers Brags Pinterest Party. I have pinned it to the Bloggers Brags PInterest Board. Hi Keitha, thanks alot, my family really liked it. Hi Anne, thanks, haha it certainly goes fast, give it a try it is worth it. what a lovely way to eat summer berries! Hi, thanks, it is a nice twist on a classic tiramisu. Thanks for stopping by.